Please welcome today's paranormal guest author Violet Yates. Violet is the author of Forgotten Forest of the Innocent , Lost and Found , Leaves of the Fall and Tears of Heaven. Violet: I started writing stories when I was eight years old. I read Highlights for Children, a children's magazine, a lot back then. I wrote a story about a bunny and submitted it to them. They didn't use the story. Later, after I had my kids, I wrote a lot of non-fiction, like Letters to the Editor. They always were published. I really didn't think seriously about writing fiction until I was in my mid-twenties. I bought numerous notebooks, intending to start, but didn't know where to start. Somewhere around 2001, I jumped in. I wrote my first novel after 9-11 happened- I realized at that point that life was short and it was time to start realizing my dreams. Of course, my first novel was awful. I went back to school after receiving numerous rejection letters and learned how to write better while I was an English major. Violet: While I was planning on doing an independent study with one of my professors, the idea of using Hawaiian culture came into play. I wanted my book to be unique, and a big part of Hawaiian culture is their gods and goddesses. 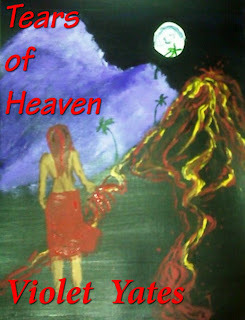 So I started putting little references here and there about Madame Pele, the Hawaiian Fire Goddess, into my novel. Much later, I realized I could have my character, Lena, take on Pele's powers, and thus, it would be classified as paranormal, but literary as well. Violet: I think the magnetism of Pele will draw people in. Face it, people like bad characters as much as they like heroines. Lena, who takes on Pele's powers in my novel, is a classic seductress who will stop at almost nothing to take what she wants, and what she wants is Ikaika. She will murder to have him. Whether she gets him is for the reader to discover. Lena Ka'awa takes on the powers of the Hawaiian Fire Goddess Pele, which causes catastrophe for Kaitlyn and Ikaika. Kaitlyn's husband dies in a fiery car accident. Ikaika's wife, Beth, and their child, Aolani, are also killed. Kaitlyn and Ikaika meet up at the graveside and look to each other for friendship and comfort. Aolani is now a ghost with supernatural powers; she 'pushes' Kaitlyn to investigate the 'accident' further, causing them to suspect that Lena killed them. The volcano is about to blow and all their lives are in danger- they need to find out how to appease Pele… will they find the answer in time to save them? Can they fight against the awesome powers of Pele? Thank you Violet for joining us here today at From the Shadows! To learn more about Violet Yates and her books, please visit her website. Thanks for the opportunity, EJ! This is awesome. Aloha! Thank you Violet for the lovely interview!